Such an absolutely beautifully rendered planet! Well done. Your space art is extremely gorgeous! The essence of speed is very notable in this piece, which in a way kinda scares me just how that red shepherd moon is still holding itself together if it's zooming at THAT speed. Its so perfect and beautiful and both colors and lightning are so insane, its just those flat looking asteroids ... ^^"
Your eye for detail and sense of composition, movement and color are among the best I've seen! Thank you for being an inspiration. The auroras are a great touch! I personally don't like the close/blurry asteroids/rocks that you have on the left. I feel they don't add anything to the image, and distract from the overall framing of the rest of it. Without those, I would easily put this into my background rotation. With them, it's close, but I'll pass. Stunning art, beautiful and inspirational. The colours of the drawing weave together very smoothly. I also like the idea of having the storm/aurora like effect at the pole, although the shape is too regular. Moreover, the lighting deserves praise for its consistency. However, since I am a physicist, I must say the asteroids are not necessary- the proportion seems a little off and I think they're rather too large to be stable. But I'm just nit-picking ! But also, is that a planet orbiting the gas giant? I think it looks cool! Not temperature-wise of course, which doesn't make too much sense. The extra little bits you've added are also marvellous e.g. the galaxy in the background and what I presume to be a red nebula, which also act as different light sources to give a rich variation in colours. Furthermore, I also compliment the fact that the extra features are not too cluttered, being spaced out just enough to make the drawing interesting. A love the composition, rings and aurora on this. Not a fan of the asteroids though, they feel too smooth and regular, and don't scale well with the ship. This is quite amazing! Details are pretty good and they actually make this entire piece totally cool. This has such a perfect balance of action and tranquility that I can tell is deliberate. 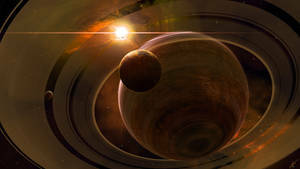 The left side is very energetic with the fiery orange colour scheme, the spaceship and asteroids racing past and a burning moon leaving its hot trail between the rings, all creating a sense of dynamic urgency. Then on the other side it's a different story altogether. Cool aqua colours, a heavenly gas giant with aurora's and all and a moon that seems to be the polar opposite of the one closer to us. Very good composition!